Dunton Stables now offers a range of all inclusive horse riding holidays & weekends which include horse trekking, breakfast, lunch & dinner at our riding centre. How regularly do you ride? Nestled in the heart of North Warwickshire, Dunton Stables offer donkey rides, horse riding, pony trekking and horse riding holidays. We are ABRS approved as well as offering a wide range of horse riding and stable management activites to children and adults of all abilities. We also provide donkey ride hire and horse rug washing as well as many more equestrian services. Whether you are looking for structured and progressive horse riding lessons, a fun family activity or the opportunity to try something new to you, Dunton Stables offers safe and enjoyable experiences to meet your needs. Dunton Stables offers donkey hire for donkey rides at your event. Whether you are holding a country fare, farming show or are hosting a large family gathering for a wedding or anniversary, hiring donkeys for children to ride is a great way of keeping your younger guests entertained safely. 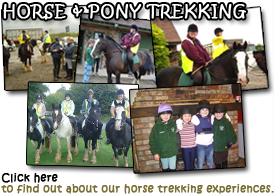 As an APRS approved donkey rides, horse & pony trekking stables centre we are able to offer pony & horse stables management courses. Additionally we hire donkeys for racing and donkey derbies. Donkey derbies are a great idea for a funding raising day out for all the family. We can help with advise about everything from what safety equipment to wear, what type of donkey derby course to setup, donkey welfare, setting up a donkey paddocks for resting donkeys, advertising for your event and guidelines on suitable donkey racing rules. For more information and pricing, view the Dunton Stables price list, contact us via our contact form call us directly with your enquiries: 07950 146740.